Please send me corrections and additions – but note that mainly books and exhibition catalogues on the art of specific art style regions or peoples are included, except where only article-length treatments are known to me. It lists mainly books and exhibition catalogues which focus on an individual art style region or people of Oceania. Other publications are mentioned only if no book-length treatment is known to me. Further readings are provided in the bibliographies of the works listed. Some of the following headings refer to geographical regions, others to peoples in these regions. This may not be satisfactory but is the best I can do at present – it also reflects the literature to some extent. The headings assume art style distinctions that may not be sound. Any suggestions for improvements will be gratefully received. The following have articles by distinct authors on many individual Oceanic art style regions. – Fraser, Jane (ed.) 1996, Dictionary of Art. Grove. – Newton, Douglas 1999, Arts of the South Seas: Island Southeast Asia, Melanesia, Polynesia, Micronesia. The Collections of the Barbier-Mueller Museum. Munich: Prestel. – Peltier, Philippe and Floriane Morin. 2006. Shadows of New Guinea: Art from the Great Island of Oceania in the Barbier-Mueller Collections. Paris: Somogy and Geneva: musee barbier-mueller. – Badner, M. 1968, The Figural Sculpture and Iconography of Admiralty Island Art. Ph.D. thesis, Columbia University. – Kaufmann, Christian, Kocher Schmidt, Christin & Ohnemas, Sylvia (ads). 2002. admiralty islands: art from the south seas. Zürich: Museum Rietberg Zürich. – Nebenmann, Hans 1934, Admiralitaets Inseln. Vol. 3 of Ergebnisse der Suedsee Expedition 1908-10. Hamburg: Friederichsen, De Gruyter & Co.
– Ohnemus, Sylvia 1996, Zur Kultur der Admiralitaets-Insulaner: Die Sammlung Alfred Bueller im Museum fuer Voelkerkunde Basel. Basel. – Otto, Ton. 1994. ‘A Bibliography of Manus Province’. Research in Melanesia Vol. 18, pp. 113-77. – Parkinson, R. 1999, Thirty Years in the South Seas. Translation by John Dennison of Dreissig Jahre in der Suedsee (1907). Bathurst: Crawford House Publishing. – Gerbrands, Adrian A. (ed.) 1967, The Asmat of New Guinea: The Journal of Michael Clark Rockefeller. New York: Museum of Primitive Art. Helferich, Klaus, Jebens, Holger, Nelke, Wolfgang & Winkelman, Carolina 1995, Asmat Mythos und Kunst: Im Leben mit den Ahnen. Berlin: Museum fuer Voelkerkunde. – Hoggerbrugge, Jac & Kooijman, Simon 1976, 70 Years of Asmat Woodcarving. Breda: Rijksmuseum voor Volkenkunde. – Konrad, G. Konrad U. & Schneebaum T. 1981, Asmat: Life with the Ancestors. Glashuetten/TS: Friedhelm Brueckner. – Konrad, Gunter & Konrad, Ursula (eds) 1996, Asmat Myth and Ritual: The Inspiration of Art. Venezia: Erizzo Editrice. – Schneebaum, Tobias 1985, Asmat Images from the collection of the Asmat Museum of Culture and Progress. N.p. : Asmat Museum of Culture and Progress. — 1990, Embodied Spirits: Ritual Carvings of the Asmat. Salem: Peabody Museum of Salem. – Smidt, Dirk (ed.) 1993, Asmat Art: Woodcarvings of Southwest New Guinea. Leiden: Periplus. – Bodrogi, T. 1959, ‘New Guinea Style Provinces: The Style Province “Astrolabe Bay”’. Puscula Ethnologica Memoriae Ludovici Biro Sacra (Hungarian Academy of Sciences, Budapest) Vol. 6, pp. 39-99. — 1961, Art in North-East New Guinea. Budapest: Hungarian Academy of Sciences. – Kunze, G. 1896. Karkar oder Dampier-Insel, Gotha. – Vargyas, Gabor, I think he has a chapter on the Astrolabe collection made by Biro in the PAA volume of the 1993 conference in Adelaide coming out in 1999. – Greub, S. (ed.) 1992, Art of Northwest New Guinea From Geelvink Bay, Humboldt Bay, and Lake Sentani. New York: Rizzoli. – Dauncey, H.M. 1913. Papuan Pictures. – Holdsworth, David. 1972. Port Moresby. Port Moresby: Robert Brown & Associates. 24 pp pictures and text. – Irwin, Geoffrey. 1985. The Emergence of Mailu: as a central place in coastal Papuan prehistory. Terra Australis Nr 10. Canberra: Department of Prehistory, RSPS, The Australian National University. – Saville, W.J.V. 1926, In Unknown New Guinea. London: Seeley Service & Co. American edn: Philadelphia: J.B. Lippincott. – Gardner, Robert & Heider, Karl G. 1969, Gardens of War: Life and Death in the New Guinea Stone Age. London: Andre Deutsch. – Heider, Karl G. 1970, The Dugum Dani. Chicago: Aldine. — 1979, Grand Valley Dani: Peaceful Warriors. New York: Holt, Reinhart & Winston. – Crawford, A.L. 1981, AIDA Life and Ceremony of the Gogodala. Bathurst: Robert Brown in Association with the National Cultural Council of Papua New Guinea. – Boylan, Chris & North, Great 1997, ‘Highlands Art of New Guinea’, The World of Tribal Arts, Vol. 4, No. 3., pp. 72-83. – O’Hanlon, Michael 1989, Paradise: Portraying the New Guinea Highlands. London: Crawford House Press. – Rule, Murray. 1993. The Culture and Language of the Foe: The People of Lake Kutubu, Southern Highlands Province, Papua New Guinea. Merewether, NSW: Murray Rule for Chevron Niugini. – Sillitoe, Paul 1988, Made in Niugini (Technology in the Highlands of Papua New Guinea). London: British Museum Publications. – Strathern, M. & M. 1971, Self-Decoration in Mt Hagen. London: Backworth. – Wirz, Paul. 1952. A Description of Musical Instruments from Central north-eastern New Guinea & On some hitherto unknown objects from the Highlands of central north-eastern New Guinnea. Amsterdam: Uitgave Koninklijk Instituut voor de Tropen. [Chimbu mouth-harps, Mt Hagen flute, Korogo (middle Sepik ceremonial flutes, Chimbu ocarinas; Dom head-crutches, carved houseboards.] Mitchell L.
– Webb, Virginia-Lee. 2011. Ancestors of the Lake: Art of Lake Sentani and Humboldt Bay, New Guinea. The Menil Collection. Houston: Menil Foundation. – Bodrogi, Tibor 1961, Art in North-East New Guinea. Budapest: Hungarian Academy of Science. – Dark, Philip J.C. 1974, Kilenge Art and Life. London: Academy. – Dark, Philip J.C. and Mavis Dark. 2009. Vukumo: Art and Life of the Kilenge A Personal Perspective. Adelaide: Crawford House Publishing. – Welsch, Robert ??? ?, has just published a book on this area whose details I don’t know yet. – Jacobs, Karen. 2012. Collecting Kamoro: Objects, encounters and representation on the southwest coast of Papua. ??? : Sidestone Press in co-operation with the Dutch National Museum of Ethnology, Leiden. – Landtman, Gunnar 1933, Ethnographical Collection from the Kiwai District of British New Guinea in the National Museum of Finland. Helsingfors: Published by the Commission of the Antell Collection. – Baaren, Th. P. van 1968, Korwars and Korwar Style: Art and Ancestor Worship in North-West New Guinea. The Hague: Mouton & Co.
– Kooijman, S. 1959, The Art of Lake Sentani. New York: The Museum of Primitive Art. – Baal, J. van 1966, Dema. Description and Analysis of Marind-Anim Culture South New Guinea). Translation series No. 9. The Hague: Koninklijk Instituut voor Taal-, Land- en Volkenkunde. – Wirz, P. 1978 (1922-25), Die Marind-anim von Hollaendisch Sued-Neu-Guinea. 2 Vols. New York: Arno Press. – Meyer, Anthony JP 1995, Oceanic Art. Koeln: Koenemann.Vol. I, pp. 164-167. – Beran, Harry 1980, Massim Tribal Art. Wollongong: Wollongong City Gallery. – Campbell, Shirley F. 2002. The Art of Kula. Oxford: Berg. – Chave, Sophie 1987, Culture materielle et creation artistique en pays Massim. M.A. thesis. University of Paris. – Hamson, Michael and Richard Aldridge. 2009. Art of the Massim & Collingwood Bay. Palos Verdes Estates, Cal. : Michael Hamson Oceanic Art. – Newton, Douglas 1975, Massim: Art of the Massim Area, New Guinea. New York: The Museum of Primitive Art. – Norick, F.A. 1976, An Analysis of the Material Culture of the Trobriand Islands Based upon the Collection of Bronislaw Malinowski. Ph.D. thesis. University of Califirnia. – Le Pays Massim Papua New Guinea 1987, Paris: Galerie Meyer. – Shack, William A. 1985, The Kula. A Bronislaw Malinowski Centennial Exhibition. Berkeley, Calif.: Robert H. Lowie Museum of Anthropology. – Kooijman, Simon 1984, Art, Art Object and Ritual in the Mimika Culture. Leiden: E.J. Brill. – Newton, Douglas 1999, Arts of the South Seas, lists publications on particular types of East New Britain artworks. – Parkinson, R. 1999, Thirty Years in the South Seas. Translation by John Dennison of Dreissig Jahre in der Suedsee (1887). Bathurst: Crawford House Publishing. – Boulay, R., Kasarhérou, E., Marchal, H. 1990, De jade et de nacre: Patrimoine artistique kanak. Paris: Reunion des Musee Nationaux. – Dougoud, Colombo. 2007. Bambous Kanak: Une Passion de Marguerite Lobsiger-Dellenbach. Geneve: Musée d’ethnographie. – Kasarherou, E. 1993, Le Masque Kanak. Marsaille: Edition Parantheses. – Leenhardt, M. 1930. Notes D’Ethnologie Néo-Calédonienne. Paris” Institut D’Ethnologie. – Luquet, G.H. 1926. L’Art ne-caledonien. Documents recueillis par Marius Archambault. Paris: Travaux et Memoires de l’Institut d’Ethnologie. – Métais, Eliane. N.d. Art Neo-Caledonien. Paris: Nouvelles Editions Latine. – Sarasin, Fritz. 1929. Die Ethnologie der Neu-Caledonier und Loyalty-Insulaner mit Atlas. 2 Vols. Munich: C.W. Kreidel. – Albert, Steven M. 1986. ‘”Completely by Accident I Discovered its Meaning”: The Iconography of New Ireland Malagan.’, Journal of the Polynesian Scoeity, vol. 95. – Gunn, Michael. 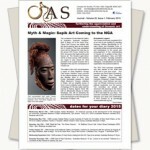 1997, Ritual Arts of Oceania New Ireland in the Collection of the Barbier-Mueller Museum. Milan: Skira Editore. – Gunn, Michael and Philippe Peltier. 2006. New Ireland: Art of the South Pacific. Paris: Musée du quai Branly and Milan: 5 Continents Editions. – Hallinan, J. Peter. 1990, Revelation of the Malagans: The Ritual Art of New Ireland. Florida Gardens, Queensland: Tribal Arts Gallery. – Helfrich, Klaus. 1973. Malanggan. 1. Berlin: Museum für Völkerkunde. – Lincoln, L. (ed.) 1987, Assemblage of Spirits: Idea and Image in New Ireland. New York: George Braziller and the Minneapolis Institute of Arts. – Stephan, Emil. 1907. Südseekunst: Beiträge zur Kunst des Bismarck-Archipels und zur Urgeschichte der Kunst überhapt. Berlin: Dietrich Reimer. – Stephan, Emil & Graebner, Fritz. 1907. Neu-Mecklenburg (Bismarck-Archipel): Die Küste von Umuddu bis Kap St. Georg. Forschungsergebnisse bei dem Vermessungsfahrten von S.M.S. Möwe in Jahre 1904. Berlin: Dietrich Riemer. – Meyer, Anthony JP 1995, Oceanic Art. Koeln: Koenemann. Vol. I, pp. 313-315. – Holdsworth, David 1984, Eastern Papua New Guinea: Northern and Milne Bay Provinces. Bathurst: Robert Brown. – Meyer, Anthony JP 1995, Oceanic Art. Koeln: Koenemann. Vol. I, pp. 154-157. – Beier, Ulli and Albert Maori Kiki. 1970. HOHAO: The uneasy survival of an art form in the Papuan Gulf. Melbourne: Nelson. – Hamson, Michael. 20?/. Red Eye of the Sun. – Newton, Douglas 1961, Art Styles of the Papuan Gulf. New York: The Museum of Primitive Art. – Williams, F.E. 1923. ‘The Collection of Curios and the Preservation of Culture.’ Anthropology Report Nr 3. Port Moresby: Edward George Baker, Government Printer. – Welsh, Robert L, Webb, Virginia-Lee, and Haraha, Sebastian. 2006. Coaxing the Spirits to Dance: Art and Society in the Papuan Gulf of New Guinea. Hanover, New Hampshire: Hood Museum of Art, Dartmouth College. – Birket-Smith, Kaj. 1956. An Ethnological Sketch of Rennell Island. København: Det Kongelige Danske Videnskabernes Selskab. (222 pp. Well-illustrated with artefacts.) Fisher has copy. – Hauser-Schaeublin, B. 1989, Leben in Linie, Muster und Farbe: Einführung in die Betrachtung aussereuropäischer Kunst am Beispiel der Abelam, Papua Neuguinea. Basel: [Birkhäuser – spelling?]. – Koch, Gerd 1968, Kultur der Abelam. Berlin: Museum für Voelkerkunde. – Losche, Diane 1982, The Abelam: a people of Papua New Guinea. Sydney: The Australian Museum. – Hamson, Michael (ed.) Art of the Boiken. Palos Verdes Estates, Cal. : Michael Hamson Oceanic Art. – Haberland, E. 1968, The Caves of Carawari. New York. – Kaufmann, Christian. 2004. Korewori: Magic Art from the Rain Forest. Adelaide: Crawford House Publishing Australia. – Bowden, Ross 1983, Yena: Art and Ceremony in a Sepik Society. Oxford: Pitt Rivers Museum. – Craig, Barry 1988, Art and Decoration of Central New Guinea. Aylesbury, Bucks: Shire Publications. * Newton, Douglas 1965, Bibliography of Sepik District Art Annotated for Illustrations, Part I, 20 pp., Museum of Primitive Art. – Dennett, H. & P. 1975. Mak Belong Sepik. Wewak: Wirui Press. – Greub, Suzanne (ed.) 1985, Authority and Ornament: Art of the Sepik River. Basel: Tribal Art Centre. – Kelm H. 1966-68, Kunst vom Sepik. 3 vols. Berlin: Museum fuer Voelkerkunde. – Lutkehaus, N. (ed.) 1990, Sepik Heritage: Tradition and Change in Papua New Guinea. Durham: Carolina Academic Press. – Newton, Douglas 1971, Crocodile and Cassowary: Religious Art of the Upper Sepik River, New Guinea. New York: The Museum of Primitive Art. Schefold, Raimar. 1966. Versuch einer Stilanalyse der Aufhängehaken vom Mittleren Sepia in Neu-Guinea. Basel: Pharos. Basler Beitrage zur Ethnologie, Band 4. – Burt, Ben. ?2009. Body Ornaments of Malaita, Solomon Islands. British Museum Press. 176 pp. £ 25. – Meyer, Anthony JP. 2011. Art of the Solomon Islands and other Works of Art from the Pacific Islands. Paris: Galerie Meyer. – Howarth, Crispin with Deborah Waite. 2011. Varilaku: Pacific Arts from the Solomon Islands. Canberra: National Gallery of Australia. – Starzecka, Dorota & Cranstone, B.A.I. 1974, The Solomon Islanders. London: British Museum Publications. – Waite, Deborah 1983, Art of the Solomon Islands. Geneva: musee barbier-mueller. — 1987, Artefacts from the Solomon Islands in the Julius L. Brenchley Collection. London: British Museum Publications. – Florek, Stan. 2005. The Torres Strait Islands Collection at the Australian Museum. Technical Reports of the Australian Museum, Nr 19. Sydney: Australian Museum. – Florek, Stan. 2003. ‘Behind the Mask: People of the Torres Strait and the collection of the Australian Museum’. Tribal – the magazine of tribal art. Vol. VIII, Nr 2: 50-59. * Fraser, Douglas 1963, Bibliography of Torres Straits Art, 6 pp., Museum of Primitive Art. – Fraser, D.F. 1978, Torres Straits Sculpture: a Study in Oceanic Primitive Art. New York and London: Garland. – Haddon, A.C. (ed.) 1912, Reports of the Cambridge Anthropological Expedition to Torres Straits, Vol. IV: Arts and Crafts. Cambridge: Cambridge University Press. – Herle, Anita and Jude Philp. 1998. Torres Strait Islanders: An Exhibition Marking the Centenary of the 1898 Cambridge Anthropological Expedition. Cambridge: University of Cambridge: Museum of Archaeology and Anthropology. –. 2000. ‘Custom and creativity: Nineteenth-century collections of Torres Strait Art’ in The Oxford Guide to Aboriginal Art and Culture, edited by S. Kleinert and M. Neale. Pp. 155-62. Oxford: Oxford University Press. – McNiven, Ian J. and Quinnell, Michael (eds?). 2004. Torres Strait Archaeology and Material Culture. Brisbane: Memoirs of the Queensland Museum Cultural Heritage Series, Vol. 3, Part 1. 17 essays, 386 pp, c 150 ills, 13 in colour, maps, bibliography. – Moore, D.R. 1989, Arts and Crafts of Torres Strait. Aylesbury, Bucks. : Shire Publications. — 1984, The Torres Strait Collection of A.C. Haddon. London: British Museum Press. – Philp. Jude. ????. Past Time: Torres Strait Islander Material from the Haddon Collection 1888-1905. Canberra: National Museum of Australia. – Annandale Galleries. 2008. AMBRYM: Art from Vanuatu. Sydney: Annandale Galleries. – Bonnemaison, J. Kaufmann, C. Huffman, K. & Tryon, D. 1996, Arts of Vanuatu. Bathurst: Crawford House Publishing. – Carlier, Jean-Edouard. N.d. Regard sur les îles Salomon. Paris: Voyageurs & Curieux. – Huffman, K. 1997, Vanuatu: Kunst aus der Suedsee. Basel: C. Merian. – Speiser, Felix 1990 (1923), Ethnology of Vanuatu. Trans. D.Q. Stephenson. Bathurst: Crawford House Press. – Fraser, Jane (ed.) 1996, Dictionary of Art. Grove. * This has articles on the individual states of Micronesia. There are few wide-ranging publications on the arts of particular Micronesian cultures. The following more general references may be useful. – Koch, Gerd 1986, The Material Culture of Kiribati (Nonouti-Tabitenea-Onotoa). Suva. – Jernigen, E.W. 1973, Lochuckle: A Palauan Art Tradition. Ph.D. thesis. University of Arizona. The starred publications have bibliographies on Micronesia. – Bourgoin, Philippe 1997, ‘The Forgotten Islands of the Bismarck Archipelago: the Hermits and Kaniets’, The World of Tribal Arts, Vol. IV, No1. pp. 64-79. – Barrow, T. 1979, The Art of Tahiti and the Neighbouring Society, Austral and Cook Islands. London: Thames & Hudson. – Hull, H.U. ‘Woodcarvings of the Austral Islands’, The Museum Journal, Vol. 12, No. 3, pp. 179-200. – Idiens, D. 1990, Cook Islands Art. Aylesbury, Bucks: Shire Publications. – Buck, Peter H. (Te Rangi Hiroa) 1949 (or 1944? ), Arts and Crafts of the Cook Islands. Honolulu: Bernice P. Bishop Museum. – Chauvet, Stephen 1935, L’Ile de Paques, et ses mystere. Paris: ???? – Esen-Bauer, H.-M. (ed.) 1989, 1500 Jahre Kultur der Osterinsel: Schaetze aus dem Land des Hotu Matua. Main am Rhein: Verlag Philipp von Zabern. – Heyerdahl, Thor 1976, The Art of Easter Island. London: George Allen & Unwin. – Kjellgren, Eric. ?2002. Splendid Isolation: Art of Easter Island. New York: Metropolitan Museum of Art. – Metraux, A. 1971, Ethnology of Easter Island. Bernice P. Bishop Museum Bulletin 160. Honolulu: Bishop Museum Press. – Orliac, Michel 1995, Bois Sculptes de L’Ile de Paques. Marsaille: Edition Parantheses. – Tilburg, Jo Anne van 1994, Easter Island: Archaeology, Ecology and Culture. London: British Museum Press. – Rod Ewins website <www.justpacific.com> includes a general Fiji bibliography. – Clunie, F. 1986, Yali i Viti: Shades of Viti: A Fiji Museum Catalogue. Suva: Fiji Museum. Republished 2003. – Carlier, Jean-Edouard. n.d. (2005). Archipels Fidji – Tonga – Samoa; La Polynésie Occidentale. Paris: Gallery Voyageurs & Curieux. – Ewins, Rod. 1982, Fijian Artefacts: Tasmanian Museum and Art Gallery Collection. Hobart: Tasmanian Museum and Art Gallery. – Ewins, Rod. 2009. Staying Fijian: Vatulele Island barkcloth and social identity. Adelaide: Crawford House Publishing Australia and University of Hawaii Press. – Roth, G.K. 1954. ‘Housebuilding in Fiji.’ Journal of the Royal Anthropological Institute, vol. 84, pts I and II, pp. 91-102. – Meyer, Anthony JP. 1995, Oceanic Art. Koeln: Koenemann. Vol. II, pp. 540-543. – Brigham, William Tufts. 1911. Ka Hana Kapa. The making of bark cloth in Hawaii. (Bishop Museum Press (Memoirs 3)). New York: Kraus Reprint Co.
– Cox, J.H. & Davenport, W.H. 1988, Hawaian Sculpture. 2nd edn.. Honolulu: University of Hawaii Press. – Barrow, T. 1969, Maori Wood Sculpture. Routland, Vermont and Tokyo: Charles E. Tuttle. — 1972, The Decorative Arts of the New Zealand Maori, 3rd edn. Wellington: A.H. & A.W. Reed. — 1978, Maori Art of New Zealand. Wellington: A.H. & A.W. Reed and Paris: Unesco. – Hamilton, A. 1901, Maori Art. Wellington: New Zealand Institute. – Mead, S.M. (ed.) 1?8?84, Te Maori: Maori Art from New Zealand Collections. Auckland: Heinemann in association with the American Federation of Arts. – Neich, Roger. 1993. Painted Histories: Rotorua Ngati Tarawhai Woodcarving. Auckland: Auckland University Press. – Neich, Roger. 2001. Carved Histories: Early Maori Figurative Painting. Auckland: Auckland University Press. – Neich, Roger, Mick Pendergrast, and Dorota Starzecka. 2010. The Maori Collections of the British Museum. London: British Museum Press. – Pownall, Glen 1979, Primitive Art of the New Zealand Maori. Wellington: Seven Seas Publishing. – Prickett, Nigel. 2001. Maori Origins: from Asia to Aotearoa. Auckland: David Bateman in association with Auckland War Memorial Museum. – Starzecka. D.C. (ed.) 1996, Maori Art and Culture. London: British Museum Press. – Taonga Maori: Treasures of the New Zealand Maori People 1989, Sydney: The Australian Museum. – Handy, E.S.C. 1971 (1923), Native Culture in the Marquesas. New York: Kraus Reprints. – Ivory, C.S. 1990, Marquesan Art in the Early Contact Period, 1774-1821. Ph.D. thesis, University of Washington. – Kjellgren, Eric. 2005. Adorning the World: Art of the Marquesas Islands. New York: Metropolitan Museum of Art. – Steine, K. von den 1969, Die Marquesaner und ihre Kunst. 3 vols. New York: Hacker Art Books. – Meyer, Anthony JP. 1995, Oceanic Art. Koeln: Koenemann. Vol. II, pp. 490-491. – Kramer, Augustin 1995, The Samoan Island, Vol. 2 Material Culture. Auckland: Polynesian Press. – Rose, R.G. 1971, The Material Culture of Ancient Tahiti. Ph.D. thesis, Harvard University. – James, Kerry E. 1988. Making mats and barkcloth in the Kingdom of Tonga. Suva: University of the South Pacific. – St. Cartmail, Keith 1997, The Art of Tonga. North Ryde, NSW: Craftsman House. – MacGregor, Gordon. 1971 (1937). Ethnology of Tokelau Islands. Reprint of Bishop Museum Bulletin 146. New York: Kraus. – Meyer, Anthony JP. 1995, Oceanic Art. Koeln: Koenemann. Vol. II, pp. 538-9. – Meyer, Anthony JP. 1995, Oceanic Art. Koeln: Koenemann. Vol. II, pp. 488-489. – Meyer, Anthony JP 1995, Oceanic Art. Koeln: Koenemann. Volume II, pp. 592-593. – Koch, Gerd 1971, Materielle Kultur der Santa-Cruz Inseln. Berlin: Museum fuer Voelkerkunde. – Appel, Michaela. 2005. Oceania: World Views of the South Seas. Staatliches Museum für Völkerkunde München. Pp. 26-30.